It is with great regret that we note the passing of Ray Larsen, W7NMK, on Thursday, April 11. Ray was 98 years old, possibly the oldest ham in Utah. Ray got his first license in 1933 at age 12, and stayed active in the hobby for virtually his whole life. He served in the military during World War II, and on his return used his electronics skill to get a job at Standard Supply Company. He helped organize hams to provide communications for the new “Civil Defense” organization at the end of the war. Ray was a great friend to UARC through much of his life. He created the name of our publication, The Microvolt, in the late 1940's and served on the UARC Board of Directors for many years. He frequently found electronic items he could give away for door prizes at club meetings. Last December he attended the UARC Officers' Christmas get-together and was amazingly alert for a 98-year-old. Ray's obituary can be found here. An inexpensive four-band mobile rig called the “SocoTran ST-7900D” has recently appeared on the market. Four bands and 25 watts for $60 to $80 sounds attractive. But beware. Clint Turner, KA7OEI, put his spectrum analyzer to work and found that the rig has serious problems with spurious emissions. The “four-band” part is also a bit misleading as one of the frequency ranges does not contain any U.S. amateur bands. The harmonic content of this transceiver is so bad that it does not meet minimum FCC requirements on two meters or the 222-MHz band. Clint was actually able to key up a 70-cm repeater while “officially” transmitting on two meters! The second and third harmonics were only 23 dB down from the fundamental. (The FCC requirement is 60 dB! See 97.307(e).) On the 222-MHz band it's a little better: 42 dB down, but still well below the legal requirement. The lone low-pass filter in the rig does keep harmonics under the wire for the 420 MHz band, but operation on the other two bands will guarantee that you can be heard on frequencies where you should not be, and that you are out of compliance with FCC rules. See Clint's full report at www.utahvhfs.org. Scroll down to the ST-7900 headline. ARRL’s Rocky Mountain Division is composed of four states: Colorado, New Mexico, Utah, and Wyoming. The chance to host the annual convention rotates among the four states. The results are in! ARRL published scores in the annual Field Day operating event (which some might call a contest) in the December issue of QST magazine, a month later than in the last several years. UARC had the second best raw score among entries from Utah, with the highest going to the Davis County Amateur Radio Club. UARC also came in second in percentile within its operating class (3A) among other portable stations. Below are the results directly from the ARRL database, arranged in order of total score. It is not really fair to use raw score to compare a station with 50 operators and three 100-watt stations to a one-operator, five-watt, battery-operated setup. A better scheme is to use “percentile” to compare a station's score only to others within its own entry class. Percentile for a particular station is the percentage of entries in its class that had lower scores than it did. For example K7CAR in the table below came in 10th place among the 125 stations that entered in the 1B1 class (one-operator portable stations). That means 115 stations had lower scores than he did, putting him in the 92nd percentile. We can't resist calling attention to the entry of WI7J, James Cowley, from Ivins. He operated in the 2C class — two transmitter mobile. (How do you do that?) He made the top 2C score in the nation, but since there was only one other 2C entry, that put him in the 50th percentile. The initial number in an entry class is the number of simultanous transmitters used. For example UARC entered in the 3A class, so used three transmitters. F: Station at an Emergency Operating Center (EOC). A class B entry may have a “1” or “2” after the letter. The number indicates the number of operators. A final “B” after the number of operators indicates battery power. 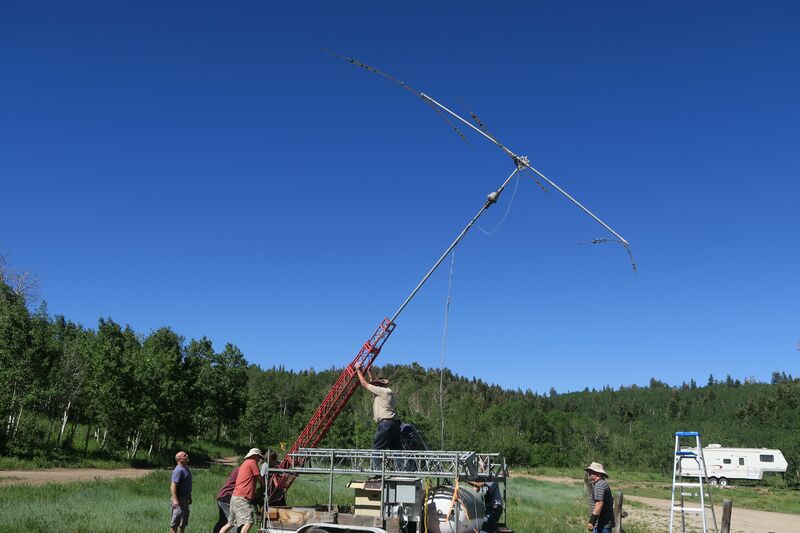 Thanks to all who came out and helped with UARC's 2018 entry in the national “Field Day” event near Payson Lakes. Things went reasonably well with the only panic moment happening when the generator needed oil and we had none on hand. Thanks to N7FOD who came to the rescue. We did only slightly worse than in 2017, making about 100 fewer contacts on SSB and about 100 more on CW. We had no digital contacts this year so that made the total contact points lower. That was partially compensated for by finding 100 more bonus points than last year. We won't know how our score compares to other groups in Utah and the nation until about November when the final scores are released and published. Below is a tabulation of our score by band and mode that might offer clues on how we can improve next year. The results are in! We now know the scores of those stations who operated in the national Field Day contest (aka “operating event”) held last June 24 and 25. We were happy to see that UARC had the best raw score. This has not happened very often! Of course it may not seem fair to compare folks operating three simultaneous transmitters and having enough operators to keep them all going through the night, to a station with one lone operator running QRP on batteries. Perhaps a more fair way to compare different sized operations is to look at the percentile of each entry within its entry class. (Percentile is the percentage of those in the same entry class that got lower scores than the one being rated.) Below we have entries listed in percentile order. As an example of how percentile works, look at NN7ZZ below. They entered in class 1B1 (one transmitter portable with one operator). There were a total of 102 stations across the country entered in that class. NN7ZZ was 10th of the 102. That means that 102 - 10 or 92 of the entries had a lower score than NN7ZZ, so NN7ZZ's percentile is 92/102 or 90.2%. The small tower with the A-3 Yagi goes up. Thanks to all who attended UARC's Field Day entry over June 24 and 25. New this year was a number of digital contacts that count for twice the number of points each as phone contacts. There were a few problems with six-meter antenna, a Vee antenna that wasn't really a Vee, RFI into the logging network, and poor performance of the smaller Yagi on 20 meters. Nevertheless, things turned out fairly well. We made about 200 more total contacts than last year (although not quite as many as 2015) and qualified for more bonus points than in recent years thanks to efforts by Chuck Johnson, WA7JOS, and Mary Jelf, KG7QNG. Below is our scoring as submitted. As we write this, one day before the submission deadline, there have been 23 Utah stations that submitted entries. We won't know how we compared to others until the results come out on the ARRL web site, probably next November. Bob Carter, WR7Q, gave us an interesting presentation on DX at the UARC meeting on January 12. His list of helpful links for DXing is available at http://user.xmission.com/~uarc/wr7q.html. If you want to have effective outdoor antennas but are not currently allowed to do so by your Home Owner‘s Association, SEND THESE EMAILS TODAY!! Scotts' Hill Get's New Battery: Several weeks ago Scotts’ Hill was the destination of one of our Wednesday Night Hikes — but there was an ulterior motive: Recent telemetry — and the power bill — indicated that something was amiss as the room was noticeably hotter than before and the power bill higher. Upon arriving and entering the building, we found it to be very noticeably warm, the cause being two-fold: The ventilation fan's bushings had seized, locking its rotor, and one of the nine 12-volt batteries was bulging, smelling of sulfur and very hot to the touch. The immediate remedy was to unplug the fan and remove the defective battery from the circuit. This had the immediate effect of allowing the building to cool down, but it spelled out another need: To replace the battery bank as soon as possible since some of these batteries — which were pulls from a 300 kVA UPS — were well over a decade old and had been in service at Scotts since 2009. The replacement was available, but presented a difficulty: Some years ago Bryan, W7CBM, approached the club noting that a fairly new set of “station” cells had been abandoned. These cells, “float charged” since that time, were much less than halfway through their 25-year lifetime and were good candidates for installation. 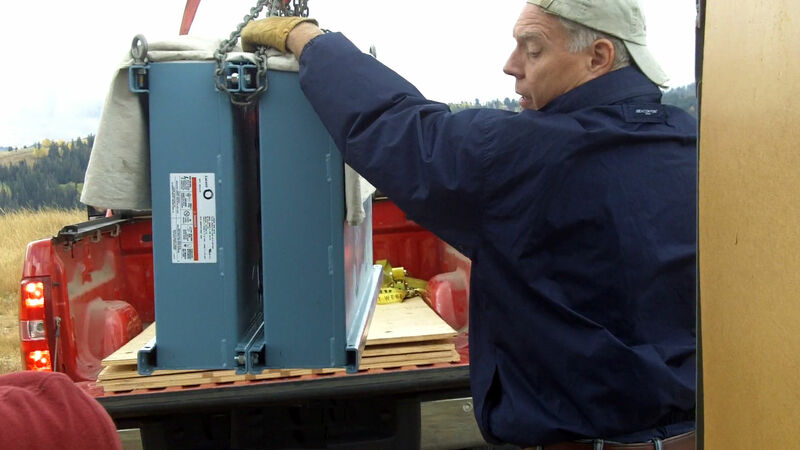 There was one problem: each 6-volt module of three cells weighed well over 800 pounds! Getting them onto the mountain and over the 8-inch door threshold would be a challenge. With the weather rapidly changing — and the uncertain state of the current battery bank — the pressure was on, but Bryan and his friend and co-worker, Randy, got to work. Borrowing a hoist they were able to lift the modules up, stand them on end and bolt them together. On the day of the installation a portable gantry was set up to put it into Randy's one-ton truck and a myriad of straps used to secure it into place. On the way to the mountaintop, another two of Bryan's friends joined the caravan and we made our way up the canyon, onto the access road, and up the mountain. Around us, clouds swirled about the higher peaks, occasionally enveloping us in fog while cold wind blew and the snowfall forecast for that altitude seemed to be delayed. Arriving on site we removed the old battery bank, set up the tall hoist and gantry, lifted the battery bank so that the truck could drive out from under the battery and so that we could attach a set of casters to it. Once on the ground, the smaller gantry was set up, straddling the doorway, allowing us maneuver the 3/4 ton battery through the doorway, over the threshold, and into the building. From that point on, it was just a matter of wheeling it into position, reconnecting the battery, and checking that it was functioning. Approximately two and a half hours after arriving, we headed off again, down to the valley but just two hours after that, the very strong weather front — the one that spawned several tornadoes and funnel clouds — struck the area and doused the mountains with rain and snow: We were glad that mother nature had delayed 16 hours or so to allow us to complete the project! Some Surprising Work on the '62 Receiver: A couple of months ago we were notified by Randy (K7SL) that we needed to work on the receiver at the Farnsworth Peak (146.620) site –– but the problem was not what one might expect: The “repair” would need a chain saw. When the receive site –– some 400 feet away from the transmitter –– was placed in the early 1980s, it was on a (more or less) barren ridge, located distantly to better remove it from the noise from the many broadcast transmitters atop the peak. In the 35 or so years since it was installed, it seems as though some sort of wild brush managed to establish a foothold on the ridge and now it had grown to the point where it had made it difficult to access the equipment box and was now taller than the bottom of the receive antenna itself. Wielding a chainsaw, a bow-saw, and “loppers,” Gordon and I spent a few hours cutting back the wild brush, gradually re-exposing the rocky ridge and, once again, the ability to just walk up to the base of the tower. Taking advantage of this opportunity, we also checked the performance of the receiver and noted that it was working as well as it had when last checked a few years ago, but we did find that the coaxial cable had been “nibbled” on by a rodent or deer at some point, exposing a short section of braid and center dielectric. Disconnecting the coax jumper and checking its loss we could see that, although water had gotten into it at some point, its loss was negligible so we re-routed the coax to the center of the tower –– more out-of-reach from larger animals –– and put several layers of tape over the damaged section, awaiting replacement on a future trip. During November, ARRL published the results of the annual Field Day Operating Event, held last June. Utah's entries in this “non-contest” included 20 from portable and mobile stations and seven from fixed stations including one emergency operating center (EOC). UARC was the top scorer with 5422 points, even though that was somewhat less than last year's 6954 (which was not the top score in that year). Raw score, though, is probably not the best way to compare success in different entry classes. It is pretty likely that a station with three 100-watt stations will make more contacts than one using a single QRP transmitter on battery power. The best way we have discovered to compare stations in different entry classes is to calculate the percentile each station achieved within the list of other stations across the country in its same operating class. We have made that calculation in the table below. Using this scheme among the portable and mobile entries, UARC comes in second (with a percentile of 89.0) to WR7Q, Bob Carter, whose single-transmitter, single-operator operation achieved a percentile of 92.3 in the 1B1 class. The top portable station did even better with a 96.3 percentile. This station was that of the W7RCH operated by the Cottonwood Heights Amateur Radio Club at the Cottonwood Heights EOC. However their competition was a bit less stiff with only 27 stations in the whole country having entered the 1F category (one transmitter in an EOC). Below is our percentile tabulation. We have included last year's value for those stations which also operated in 2015. Using UARC as an example of how to read the table, we were 36th place among 326 stations that entered the 3A class. This means that 290 3A stations had lower scores than UARC, so 290/326 gives 0.88957. Rounding to three signifiant figures we get a percentile of 89.0. Second number A "1" or "2" following the letter indicates the number of operators. Class B entries are subdivided in this way. Final “B” A “B” following the number of operators or the class letter indicates an operation powered entirely by batteries and running no more than five watts transmitter output power. Final “C” A “C” following the number of operators or the class letter indicates an operation that used commercial power for at least one of its transmitters. Example: Class 1B2B means a single-transmitter portable operation with two operators using only batteries for power and running five watts or less. The results are now available for the 2015 Field Day operating event. Field Day is a nationwide contest-like exercise to test operators' abilities to set up and operate effective portable and mobile stations. It happens on the fourth full weekend in June each year. For 2015 there were a total of 29 entries from Utah. There may have been more stations operating that didn't bother to submit their results. We like to show results in a way that equalizes the difference between operating classes. A large club station running 10 transmitters at a kilowatt each will probably make more contacts than a two-operator, single-transmitter, QRP operation running five watts. That doesn't necessarily mean that the big station did a better job of operating. The best way to compare stations with very different setups is to see how they did relative to other stations around the country in the same entry class. The mathematical maneuver called “percentile” is a technique for doing just that. Let's look at UARC's W7SP score. We operated three transmitters, so we were a “3A” entry. (The “A” indicates a club or group portable station.) Our score of 6954 points puts us in 20th place among 3A operations across the country (and Canada). There were a total of 286 3A entries, so 266 got lower scores than we did. That makes our percentile 266/286 or 93.0%. We can say happily that that is the best of any Utah station, although just a hair-width above K7UM, the Utah DX Association station at 92.9. They ran in the 6A class and brought in a total score of 13,742 points, nearly double UARC's. So how can we do even better next year? Some suggestions include operating for the full 24 hours, getting more operators up to speed on CW, and finding a way to keep tents at a habitable temperature at 4 A.M. Anyone want to volunteer to be 2016 Field Day Chairman? We would like to thank everyone who helped with UARC's 2015 Field Day entry! At least 41 hams took the hour and a half drive to the area near Payson Lakes and spent part or all of their weekend helping to set up gear and make contacts around the country. We did pretty well. The total number of contacts was 2156, 936 of which were on CW and counted for double points. By the time CW multiplier, power multiplier, and bonus points were considered we ended up with 6954 points, our second best score in the last 10 years, and possibly ever. (Our best score was 8624 in 2012 when we had the CW station and operating help of Max George, NG7M.) Several things probably contributed to our success. Lossy feedlines were replaced, yagis were tuned, we operated the CW station more hours, and we had some very good voice operators. Of course there's always room for improvement. Apparently we forgot to put the available heaters in the operating tents and from 3 A.M. to 7 A.M. all the operators had given up due to hypothermia. At least one person complained that the setup was not as well organized as might be desired. Perhaps this was due to the lack of a volunteer for “general organizer” that we had been requesting since about February. Anyone want to fill that gap for next year? There appear to have been 29 Utah stations that sent in their entries this year. We won't likely know all the scores until the folks at ARRL Headquarters get through sifting through the data in about November. When that information is available we will post it here. I enjoyed presenting the APRS stuff at your radio club. Someone asked about a copy of my talk. Here it is... I posted the presentation at the end of the first paragraph on the normal APRS page: http://aprs.org. Jim Brown's presentation on solar power and living off the grid was well received at our March UARC meeting. The slides from that presentation are now available as a PDF file here. Thanks to Jim for putting the information on line. Users of recent Yaesu VHF transceivers may occasionally receive a complaint that the first few words of each transmission are being wiped out by a CTCSS tone (aka “Touchtone”). The problem is that the “WIRES” or “Internet” mode has been turned on accidentally. WIRES (Wide-coverage Internet Repeater Enhancement System) is a system designed by Yaesu using Internet to link repeaters and having some similarities to IRLP and EchoLink. In one configuration a user can choose, on a per-transmission basis, whether he is heard only on the local repeater, a single additional repeater, or a whole network of repeaters. The Yaesu transceivers that support this option make it easy to turn the opening tone on and off so that the selection of “local” or “global” may be made quickly whenever needed. The downside of this easy access is that it's easy to turn the mode on accidentally. This can be particularly frustrating to the ham who doesn't live within 500 miles of a WIRES repeater. Clint, KA7OEI, discovered a PDF file that tells how to disable the tone on several models of Yaesu radios, either in the usual way or semi-permanently. You can find the file here. You've probably noticed a new look to the UARC web site. The new design was created by Gary Wong, AB1IP, who won our web design contest last spring. UARC President John Hardy, K7ALA, recently applied the new design to all the most commonly accessed pages. Thanks to Gary and John!